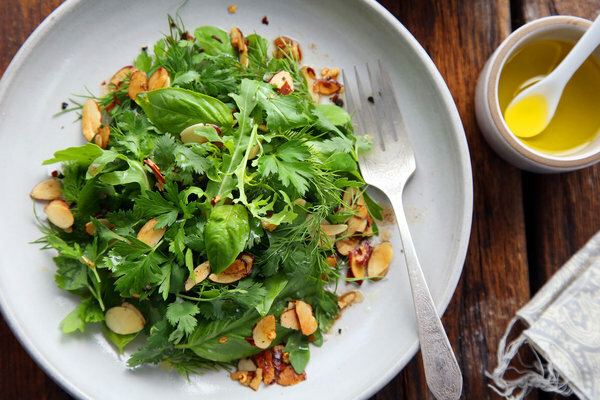 In addition to how nice it looks, the beauty of this herb salad is that it can be as sweet or as pungent as you like, served in a big heap as a fresh first course, or a small pile as a refreshing side dish, or as a palate cleanser with a cheese course. When ready to serve, place greens in a large bowl. Add salt, pepper, chile flakes, almonds, cooking butter, lemon juice and olive oil. Toss gently and season to taste, then serve immediately.